Hobart has huge potential to cut emissions, but it could do with more support from the state government. There are times in the climate space when things go right. That doesn’t happen often enough, but when it does it’s a good feeling, and I felt it at an event in Hobart last week. For reasons I’m not fully across, local government in Tasmania has responded much better to the climate question than higher levels of government. That could be because it’s not dominated by party politics, or maybe it’s more in touch with the physical world and grassroots sentiment. 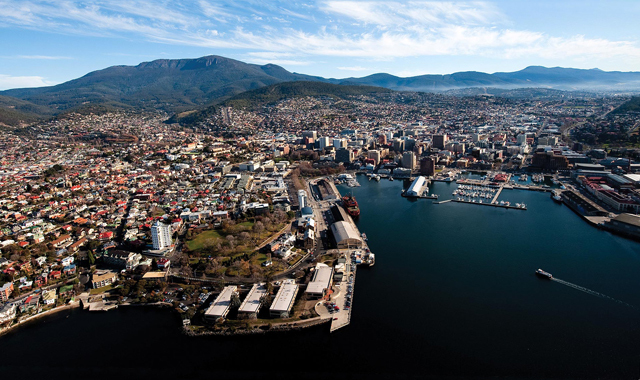 As the capital and largest city with a big ratepayer base, Hobart is expected to be a leader in local government across the state. In 2000 it became the first Tasmanian council to develop a climate strategy, and is now in the process of preparing a third version. Hobart already has achievements in this space. It traps methane from landfill to make electricity and rewards effort in waste reduction. It developed a home energy audit toolkit now in use across Tasmania, and heads up a regional bulk buy scheme yielding big savings in household energy use. Multiple schemes to save energy have put the city administration firmly on track to easily beat its target for the decade to 2020 of 35 per cent less energy consumed and 17 per cent lower emissions. All this is due to the effort of some talented and dedicated staff and a strongly supportive council, shifting the inertia that always bedevils changes in direction. But there is much more to be done. Last week the City of Hobart hosted a series of forums for stakeholders in the strategy, inviting comment on its climate change response and carbon footprint, organised by Katrina Graham, who manages the city’s climate program. The session I attended saw an almost palpable spirit of cooperation, with suggestions coming thick and fast. People seemed grateful for the chance to get things off their chest, and for an organisation that looks as if it means business. While some other capitals – Melbourne, Sydney and Canberra come to mind – have had some notable success in emissions-cutting measures and preparing for climate change, the stand-out in Australia, in terms of both ambition and achievement, is Adelaide. Adelaide has good reason to pay attention to climate. Already the driest of Australian capitals, it is exceptionally vulnerable to global warming. It has recently experienced many consecutive summers with heatwaves above 40C. Its 10 warmest years on record have all been since 2002. Adelaide City’s impressive string of achievements since 2001 include 24 per cent more energy-efficiency in buildings, a rapidly-expanding tram network, doubling of the number of cyclist and, when population and economy grew by nearly 30 per cent, cutting emissions by 20 per cent. That’s in a state which, having previously relied almost exclusively on coal-fired power, now derives almost half its electricity from renewable wind and solar. Solar is on the rooftops of one in four homes in South Australia, which also has 35 per cent of Australia’s installed wind capacity. To top it off, on Friday the state added a new weapon to its impressive arsenal – switching on a 120 megawatt-hour battery – the world’s biggest – at Hornsdale wind farm. The Tesla array’s instant response capacity will help provide much-needed stability during fluctuating power supplies. Hobart lacks Adelaide’s trams, its topography isn’t as friendly for cyclists, and it doesn’t have a state government pushing it every step of the way. But given the huge advantage over Adelaide delivered by a hydro system making up around 90 per cent of the city’s electricity, there’s every reason why Hobart should join the challenge of a carbon-neutral city. And why shouldn’t that be extended to the whole state? 0The South Australian experience teaches us that progress doesn’t happen in a vacuum. Ineffective and largely incoherent federal policies compromise all local measures, but Adelaide’s initiatives at least have the benefit of a state government with strong complementary policies solidly behind it. A big question mark hanging over the Hobart stakeholder forum I attended was the role of other levels of government, especially in this case the state government. Emissions from cars, trucks and buses, for instance, present a major obstacle to a city becoming carbon-neutral. It requires real effort from everyone, but it won’t be effective without heavy lifting from above. For many years, capable council officers and public servants have served with great distinction in strengthening energy resilience in their respective institutions. A focal point since 2008 has been the exceptional effort to lift government’s game by people of the Tasmanian Climate Change Office. The same can be said of the utterly admirable work of Hobart and other local administrations, but this gets scant attention from their political superiors. We urgently need the challenges these people face daily brought into the mainstream of government. There is to be a Tasmanian election next year, probably in March. On February 14, people of Hobart will have a chance to air views about their city’s future at Town Hall community forums. As well as helping to put Hobart on the path to carbon neutrality, that will be a fine chance for citizens to explore the missing link in our island community’s response to the climate challenge. This entry was posted in Adaptation, Australian politics, batteries, built environment, bureaucracy, carbon, carbon emissions and targets, carbon offsetting, cars, climate politics, community action, cycling, education, energy conservation, energy efficiency, leadership, local government, renewable energy, road - cycle, road - public transport, social and personal issues, Tasmanian politics, transport, wind and tagged Andy Chambers, Hobart, Hobart City, Katrina Graham, Mark Siebentritt, Seed Consulting. Bookmark the permalink.